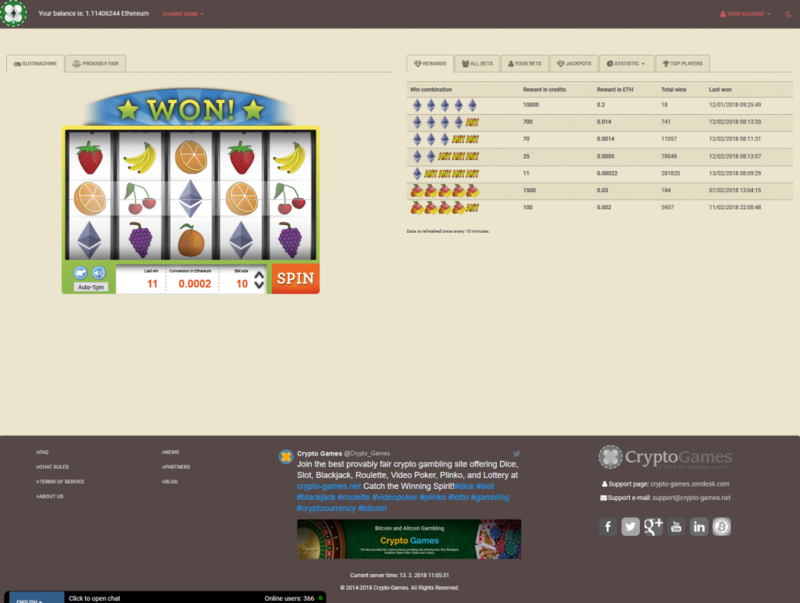 Crypto-Games, the home of Dice, Blackjack, Slot, Lottery, Roulette, Video Poker, and Plinko games. With a fully functional and simple graphical interface, the platform offers cryptocurrency game players several options on choice of games not just for fun but also to earn cryptocurrencies which can be exchanged for real money from the comfort of their living room. Crypto-Games.net is one of the highest Bitcoin and alternative cryptocurrency faucet among all cryptocurrency gaming websites. Established since 2014 with their first platform DogecoinMachine.net which was a slot machine game platform exclusively for Dogecoin. August, the same year 2014, they decided to extend cryptocurrencies supported from just Dogecoin, adding Bitcoin and some others. That was when the platform was changed to Crypto-Games.net. The lottery is without house edge. Games such as Slots, Dice, Video Pokers, Roulette, and Blackjack are easily manipulated by site owners but Crypto-Games publically displays its seed for everyone to verify the fairness of each game. Entering the server and client seeds provided into a generator proves the fairness of each game, giving players peace of mind that games are not manipulated in favor of website owners. This measure has been put in place in the gaming industry to provide a solid environment when it comes to cryptocurrency games played over the internet. Instant Account Creation: It takes about 10 seconds to register an account on their website. Users are also able to create account anonymously as no additional information about users is required apart from email and password to secure their accounts. Sleek Design and Responsiveness: The platform is easy to use and is made available for users on every platform. This makes it easy to enjoy your favorite games on from the comfort of your living room at your convenience. Multiple Cryptocurrencies: The platform provides members with not just earning in Bitcoins alone. Users are also able to earn 9 more cryptocurrencies which include Dogecoin, Ethereum, Litecoin, Dash, Peercoin, Gridcoin, PlayMoney, Monero, Stratis, and Gas. Best Paying Referral System: Crypto-Games offer 25% of house edge on every bet made by direct referrals and proceeds are immediately added to referrer’s balance. Auto Betting Feature: With the platform’s advanced Autobot betting on the platform, players can easily set their favorite betting options and make earning from wins on autopilot. Instant Deposits and Withdrawals: No matter the cryptocurrency you are funding with, you only need one confirmation for your funds to be made available to be used on the platform. Withdrawals are also instant as much as user funds on the platform are confirmed. High Returns On Single Bets: Players can earn up to 8 BTC on Dice games on single bets and up to 30 BTC on wins on Video Poker games as well. Periodic Wagering Contests: The platform rewards the top 5 players every month in BTC with a total of up to 0.965 BTC. 1st place gets 0.5 BTC, 0.2 BTC for second place, 0.1 BTC for third place, 0.05 BTC goes to the player on 4th place, and 0.025 BTC goes to the player at 5th place. Rewards are also given to 5 top ETH (Ether) and LTC (Litecoin) players. Players who wager the most on BTC, DOGE, LTC, and ETH receives a total 4500 lottery tickets. Cryptocurrency Exchange Platform: Coins can be easily traded on the Crypto-Games platform without leaving for an exchange. 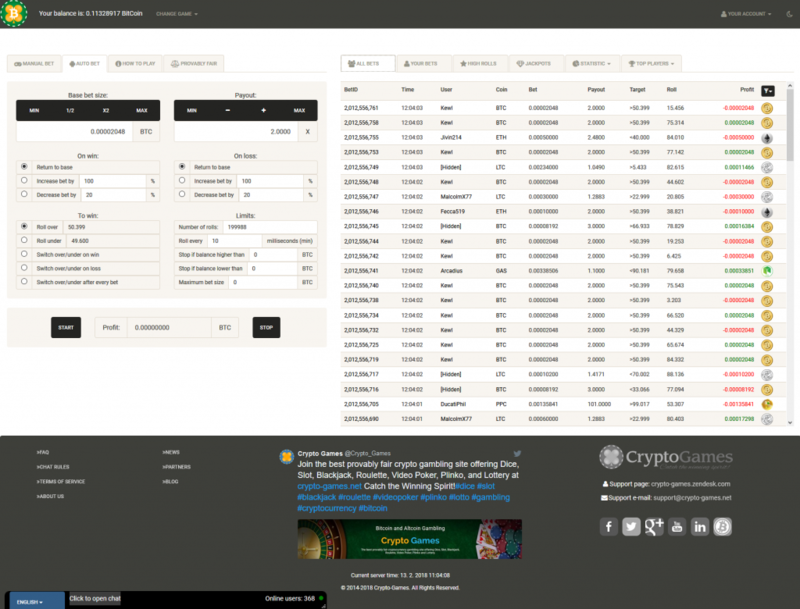 All conversions are done with a click and it costs relatively low to exchange one token for another on the platform. Strong Security: Users email, password and 2-factor authentication all play major roles in keeping user account safe and hard to penetrate by cybercriminals. Every withdrawal is confirmed by email before it’s initiated on the platform. Whether it’s your first time playing or you are looking for a new and better experience when it comes to Bitcoin Gambling, Crypto-Games is a great place to play. The site is fully functional with a large community to share experiences with. Their friendly moderators ensure you have a smooth experience on the website. Crypto-Games has gradually climbed to the top by user reviews and also having been in the industry for quite a while. Crypto-Games is therefore recommended if you are looking for non-complex and easy to use platform where to gamble and multiply your cryptocurrencies. You are guaranteed unlimited fun while learning how to play online games and earning Bitcoins.